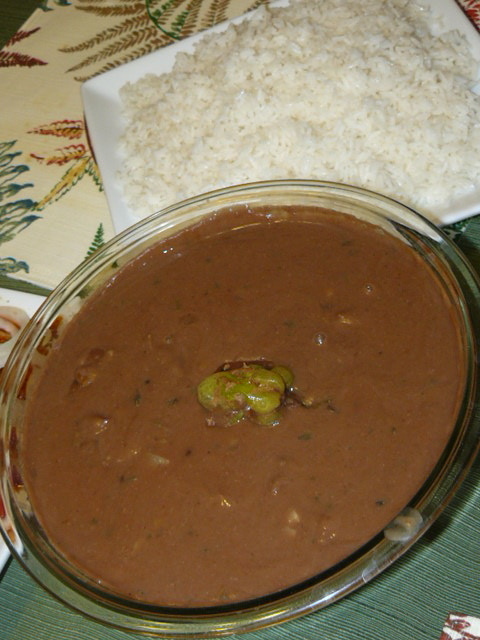 Sos Pwa (or Sauce Pois) is a bean soup that is flavored with spices and seasonings to serve with white rice or mayi moulen ak zaboka. In a large pot, bring water to a boil and add the red beans. Let it cook for 1 1/2 hours, until the beans are tender. Drain the beans but set aside the liquid to reserve. Using a food processor, add the beans, 2 cups of reserved liquid, 4 garlic cloves; puree until smooth. Heat oil in a sauce pan over medium-high heat; saute shallot and scallions for 3-5 minutes. Pour the pureed beans back into the pot and cook over medium heat. Season to taste with chicken bouillon cubes, pepper, and seasoning powder. Stir in the sauteed scallions, scallions, thyme, and parsley. Remove from heat. Serve with white rice. This brings back so many memories!! Delicious!